Jessica Simpson Ruined Previous Weight Loss Deal, What Were Her Crazy Demands? So… before there was Weight Watchers, there was NutriSystem? It turns out that Weight Watchers wasn’t the only weight loss deal Jessica Simpson ruined with her laziness. NutriSystem had it’s first shot with her and left shaking its head at the lack of effort. “Count yourself lucky,” screamed a Weight Watchers spokesman. According to Blind Gossip Jessica was in talks with NS two years ago but her manager, Joe Simpson, screwed everything up with his nonsensical demands. They’re actually quite ballsy. First he wouldn’t let anyone from the company speak or meet with Jessica before the initial photo shoot. Then he told them to lie about her starting weight and photoshop her “before” pics so she appeared skinnier. Luckily for all of us, NS refused to play ball so the Simpsons took their circus to the ever gullible Weight Watchers. And the rest was magic! Do you think Weight Watchers accepted Joe’s terms? They had to have! Jessica Simpson doesn’t need the money or the endorsement deals. There’s no way she would have signed any dotted line if she didn’t get exactly what she wanted – with a side of biscuits and gravy. But you have to remember, this is Hollywood. I have no idea if those demands are standard. It seems pretty obvious that a star will ask for their pics to be slimmed down. As for the whole not letting the company meet Jessica before the photo shoot? I find nothing smutty there. Jessica Simpson’s lazy and doesn’t get out of bed unless she has a really good incentive. Three million dollars could be one of those. But she’s pregnant now so it doesn’t matter, right? Jessica’s eating for four and it’s OK because she’s creating life! 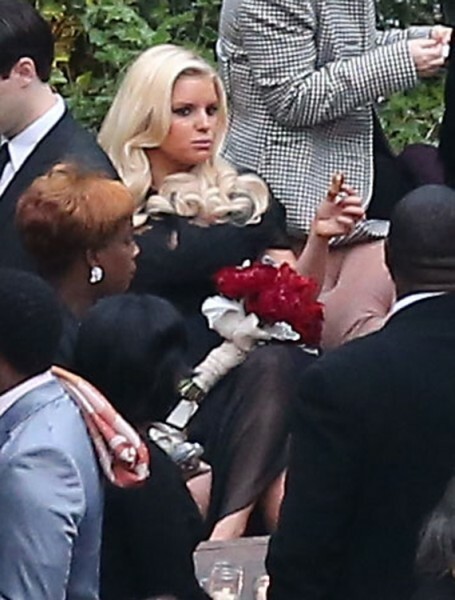 Attached are pics of Jess at best friend Cacee Cobb’s wedding to Donald Faison over the weekend. She is a pretty girl and I love the dress. Hey moms out there, does she seem more than 12 weeks along? Remember she’s probably wearing two sets of spanx in those pics. If we know anything about Jessica it’s that things aren’t always what they seem. If she’s confirming three months (which she isn’t, but she hasn’t denied) than I’m going to assume it’s closer to four. Are you surprised by the Jessica Simpson/NutriSystem deal? Do you think negotiations like that are more common in Hollywood than we think or is Jessica just the laziest of the lazy? Jessica Simpson’s Morning Sickness Is Real Reason For Weight Watchers Weight Loss!